Intricate and powerful, Rhyolite is a gemstone of amazing capacity. An igneous rock born of volcanic activity, this is the geologic child of minerals and silicates melting together in a colorful confluence that becomes a beautiful jewel. Any color of the rainbow, due to the fluxing nature of the minerals and silicates, can appear in the Rhyolite like disco balls embedded with confetti. Many of the Rhyolites have eyes: concentric circles and delicate blooms are part of the inherent beauty of this stone exhibited here in some Steens plum and blue common Opal Rhyolite set in Fine and Sterling Silver. The rough is rough but it’s worth investigating. Thunder Eggs, Plume Agates, Moss Agates, and Boulder Opals can be surrounded by Rhyolite of varying degrees of interest. Some of the stone is lackluster and has lost the components of ‘gem-i-ness’ to the ‘vug’ or contains lovely pockets of interest created from it’s heated inception. Many times there’s no better way to know what lies inside than to polish it up and see how it shines. It may be as exciting as the Thunder Egg or Opal that it encases with it’s druzy caves and mineral designs. Here you can see the Thunder Egg Blue Agate lined with Clear Quartz Druzy Crystals nestled in an eggplant colored Rhyolite. Clues about the creation of these stones are contained within. Some display undulating agate spilling into and against crazed jaspers. Flames, plumes, blooms, polka dots, and scales are just a few patterns that work their way into these natural designs. This sweet teardrop cabachon was made from Rhyolite found near the Alvord Desert. Pastel colors of Sage and Sun comingle with the color of the Steens purple mountains at Sunset. 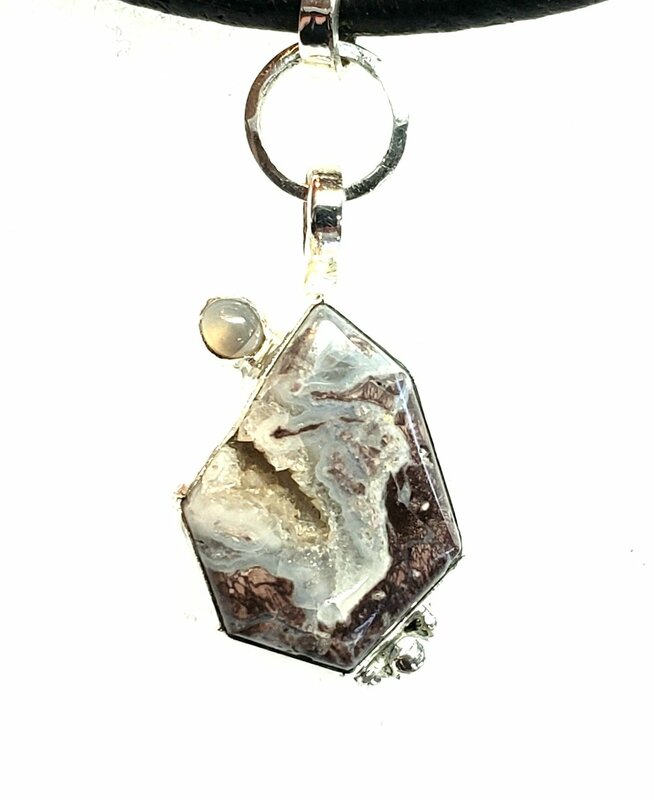 Check out New Jewelry for other fresh pieces and Rhyolite in Gemstones for more information about the stones. Older PostTo Clean or Not Too Clean?? ?